The perfect breakfast and dessert! 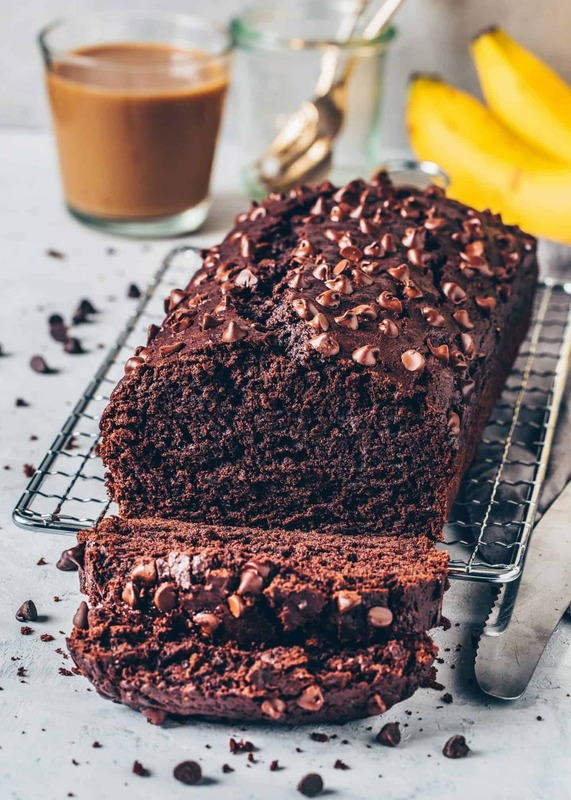 Have I mentioned how much I love banana bread and chocolate? Well, in case I haven’t, let me just say that I really do! 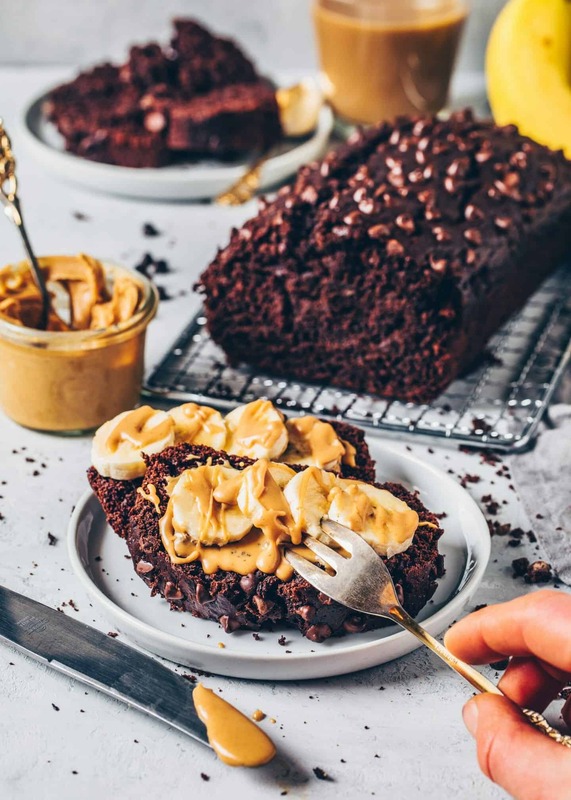 One great thing about Vegan Chocolate Banana Bread is that it’s healthier than chocolate cake, even though it almost tastes like vegan chocolate cake. So it’s the perfect sweet treat for any time of the day! I really love making it in advance and keeping it in the fridge for the following days so that I always have a quick and yummy snack on hand. But to be honest, it never lasts that long in my kitchen, because it’s too delicious not to eat all of it! 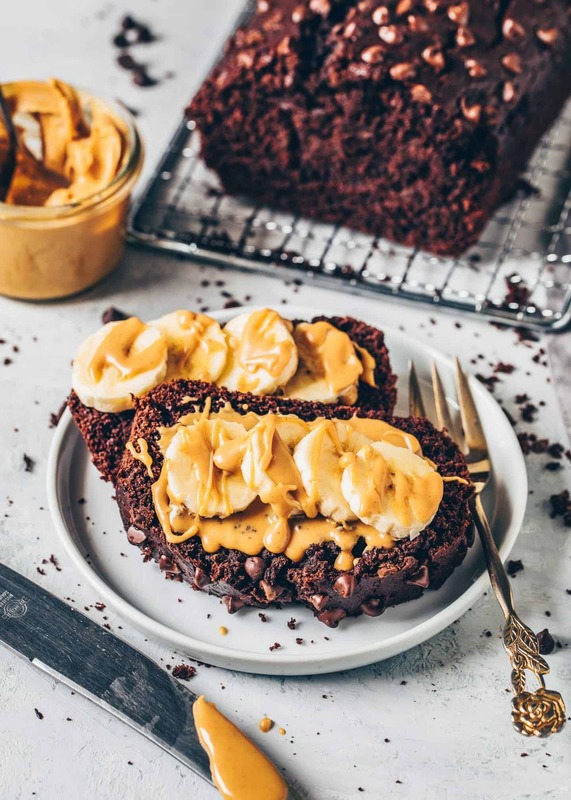 Starting by enjoying it for breakfast, then later as an afternoon dessert with ice cream on top and maybe also before going to bed as a late night snack with extra peanut butter, haha! Another great thing about this recipe is that it’s very easy to make! All you need is one bowl, a spoon, a fork, and a few simple ingredients! You don’t even need a food processor, mixer or blender! 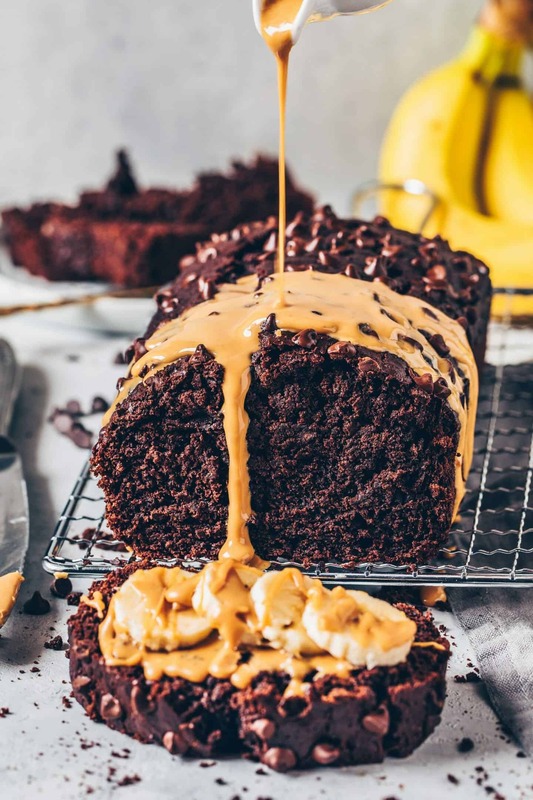 Actually, the batter is mixed together in less than 5 minutes, depending on how long you need to peel the bananas maybe, haha – okay, just joking! 😃 But I‘m not joking when I say that it really is very quick and easy to make! As I mentioned before, we need only a few ingredients! 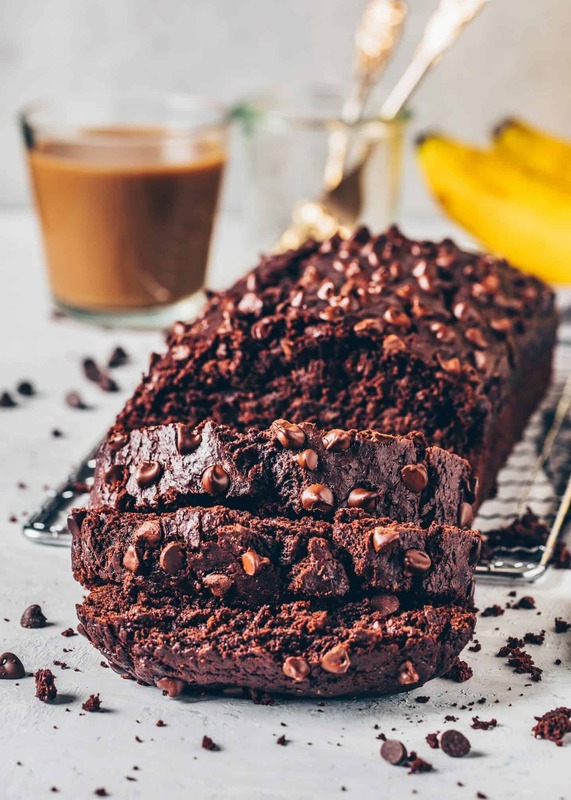 Just flour, cocoa, baking powder, ripe bananas, sugar (or another sweetener), oil, non-dairy milk, vanilla extract, and dairy-free chocolate chips for the topping. 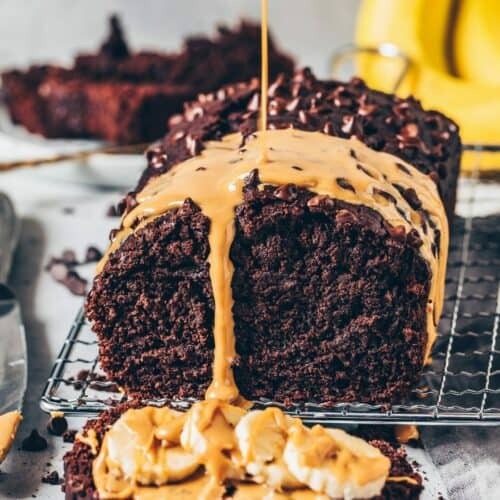 Anyways, the chocolate chips are not necessary for this recipe but if you’re like me, you can never have enough chocolate! 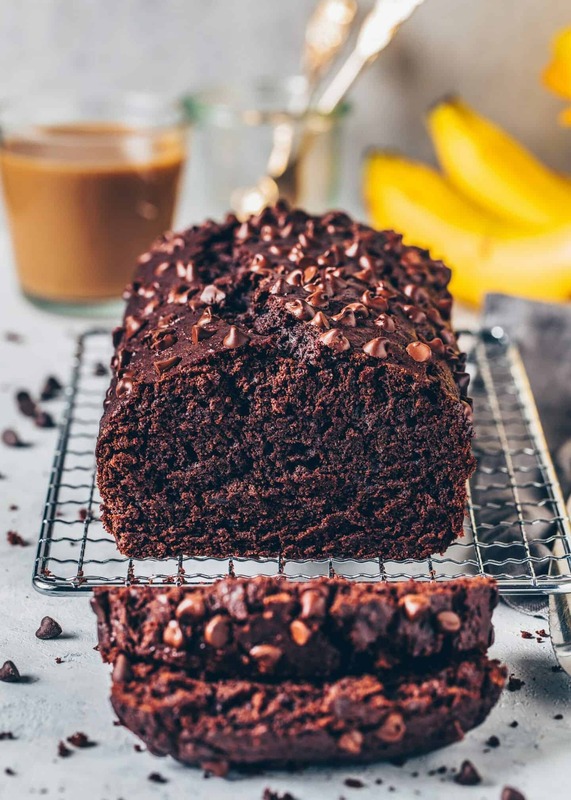 If you want to make a gluten-free Vegan Chocolate Banana Bread, you can substitute a gluten-free flour blend 1:1. If you can’t find it in a store or online shop, you can also use gluten-free oat flour or make your own oat flour. Simply put gluten-free oats into a food processor or grinder and process into oat flour. 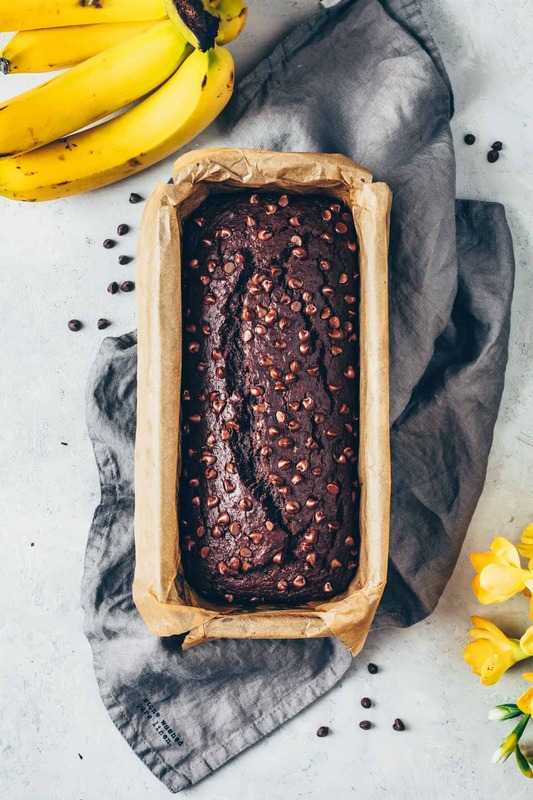 Just keep in mind that when using oat flour, your vegan banana bread will not be as soft as when you use a lighter flour. Honestly, I haven’t tried using other flours yet, but feel free to try it. I recommend adjusting the liquid and adding more non-dairy milk if needed because different types of flour absorb less or more liquid. Preheat the oven to 350˚F (175˚C). Grease and line a 9,8-inch (25cm) loaf pan with parchment paper so that there is an overhang on both sides. Place the flour, cornstarch, cocoa, baking powder, baking soda and salt in a bowl and whisk together. Mash the bananas with a fork. Add to a measuring jar along with the non-dairy milk, oil, sugar, vanilla extract and apple cider vinegar. Stir well to combine. Pour this mixture into the flour mixture and just stir until combined. Let cool completely in the pan. Then using the parchment paper to remove it. 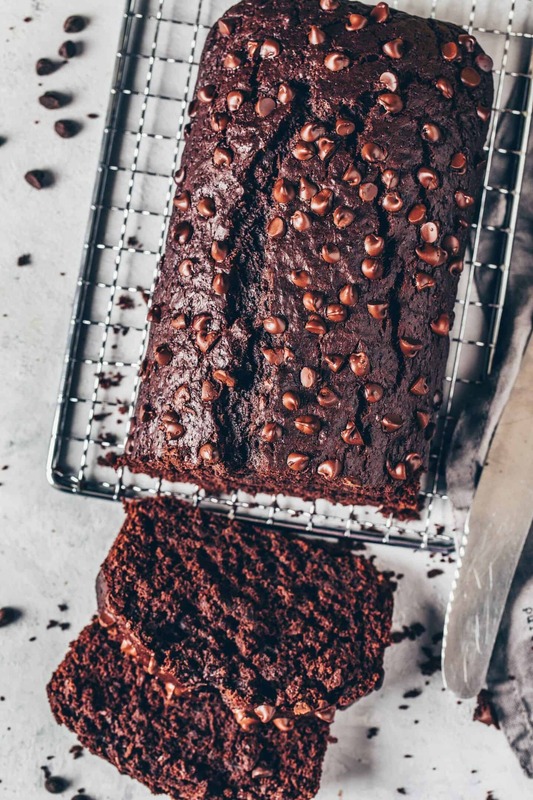 To make this banana bread gluten-free, I recommend using a gluten-free flour blend 1:1. 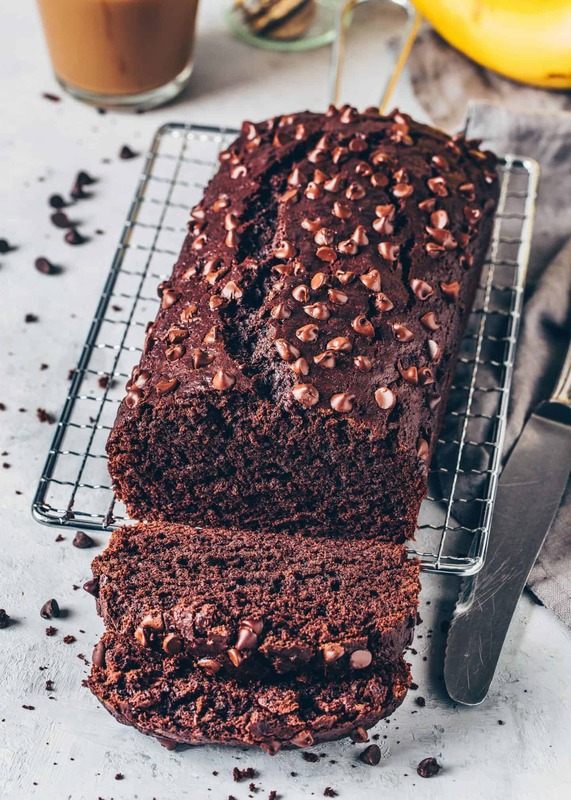 If using another flour, such as oat flour or whole grain flour, keep in mind that your banana bread won’t get as fluffy and soft as when using a lighter flour. Also, please make sure to adjust the liquid by adding more non-dairy milk, if needed, because different flours absorb different amounts of liquid. You can use any sweeteners you like, such as maple syrup, agave syrup, coconut sugar or other. What can I substitute for the sugar? I like your account very much! For this receipt, could you please post some photoa with the texture before baking? This way we will see the texture in case we use another flour 🙂 Thank you!!!! Oh yes, sure. That’s a great idea. I will do it next time 🙂 The texture should be thick and creamy. Thank you! Bianca, if I wanted to use oat flour, would I increase my almond milk to 1/2cup? I’m not sure how much additional milk you’ll need but I think 1/2 cup sounds good! 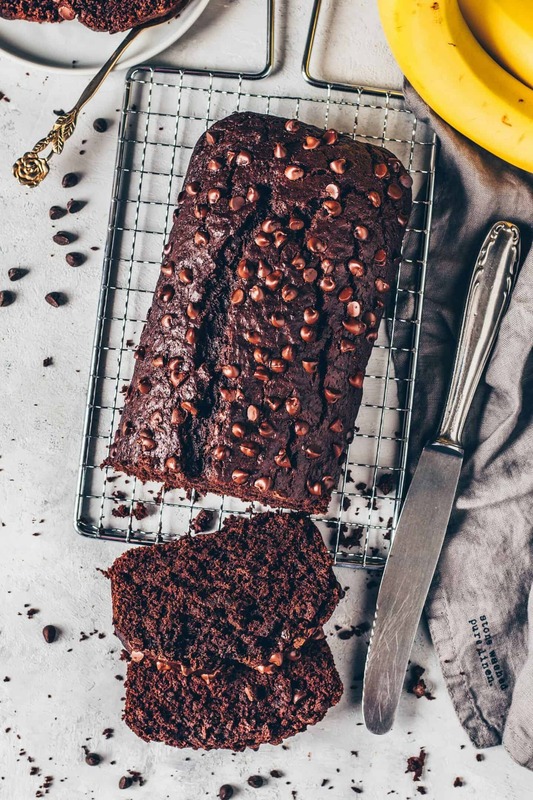 Your banana bread looks amazing Bianca. It looks so fluffy and delicious. Made this with whole wheat flour and it turned it out great! My husband loved it! Awesome recipe! Super easy to make, delicious and vegan? Wow, that’s the perfect combo. 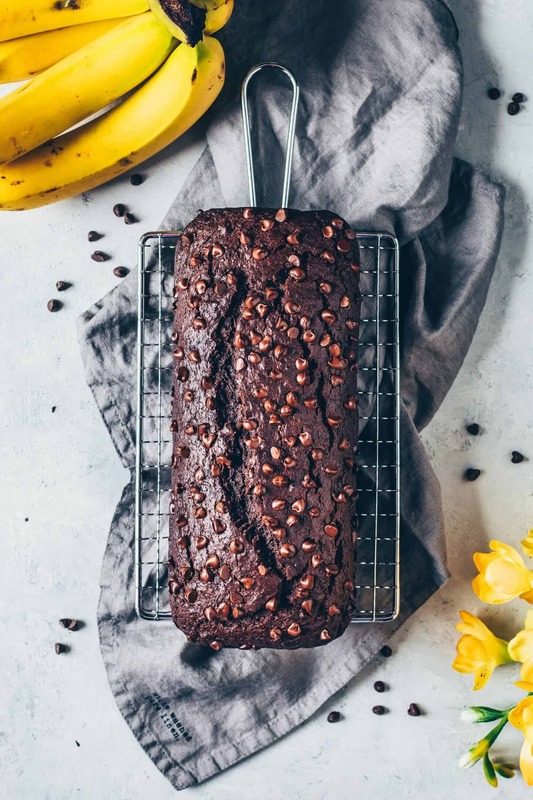 Made this banana bread yesterday and I’ll do it again for sure! My mum had no idea she’s eating a vegan cake and she loved it as well. 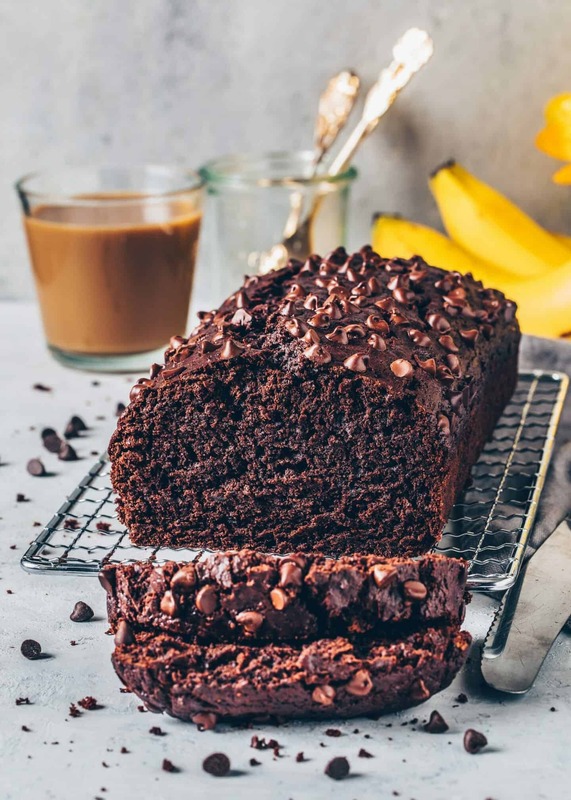 We made the chocolate banana bread yesterday and it was delicious! Love the hint of banana. We are a month in with no dairy or meat, so this was an absolute treat! The recipe was easy, too. The cornstarch = Tapioca Flour ???? My husband said it was the best banana bread in his life 😁. Thank you Bianca. 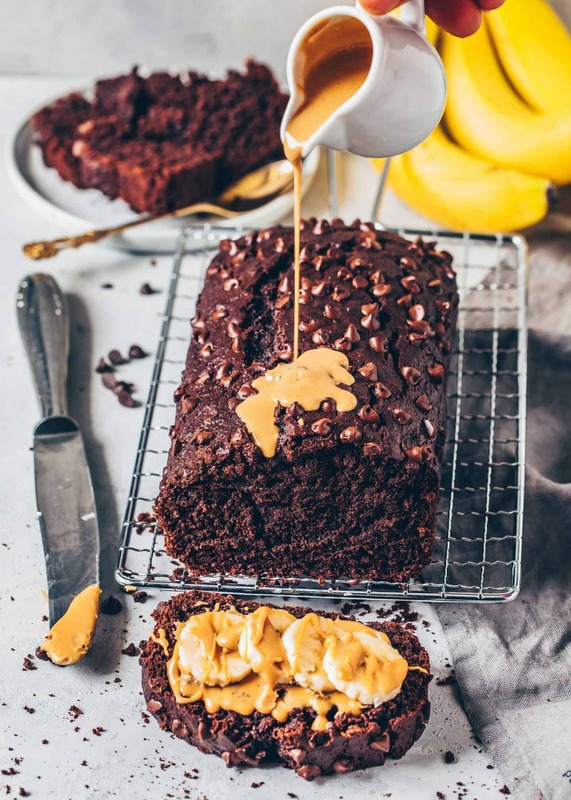 But it has all the chocolate flavour and all the moist from the banana, and the best part, definitely easy to prepare!